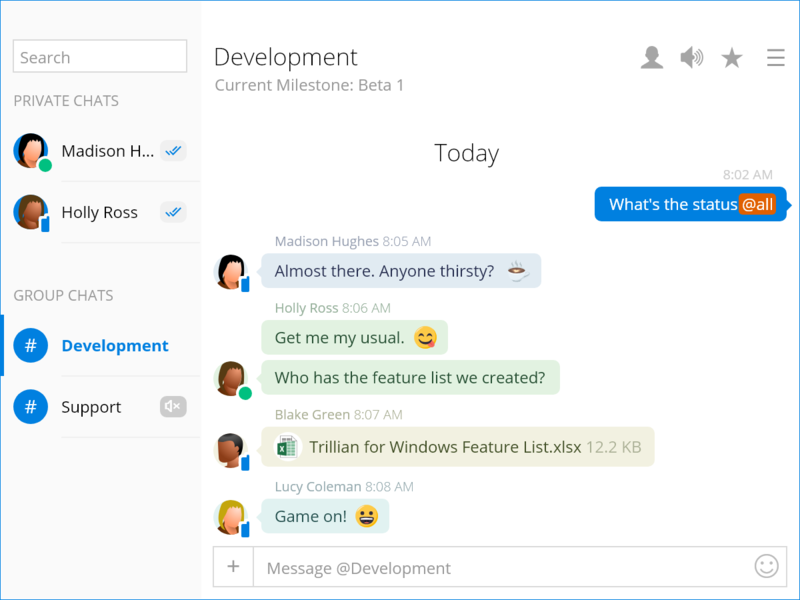 Trillian helps teams of all sizes communicate with its powerful combination of traditional instant messaging and modern team communication features. that gives you strict control over your data and doesn't break the bank. 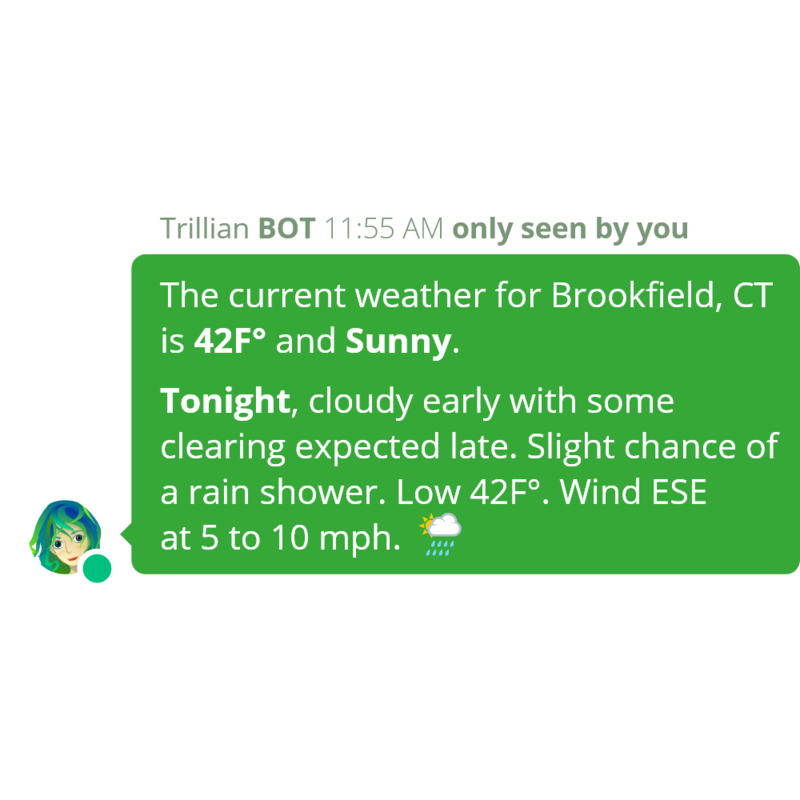 With Trillian, individual teams at your company can stay in touch through one-to-one private chats and many-to-many group chats, pull in external information with a chat bot and our RESTful API, and keep their sanity with fine-tuned control over notifications and privacy. 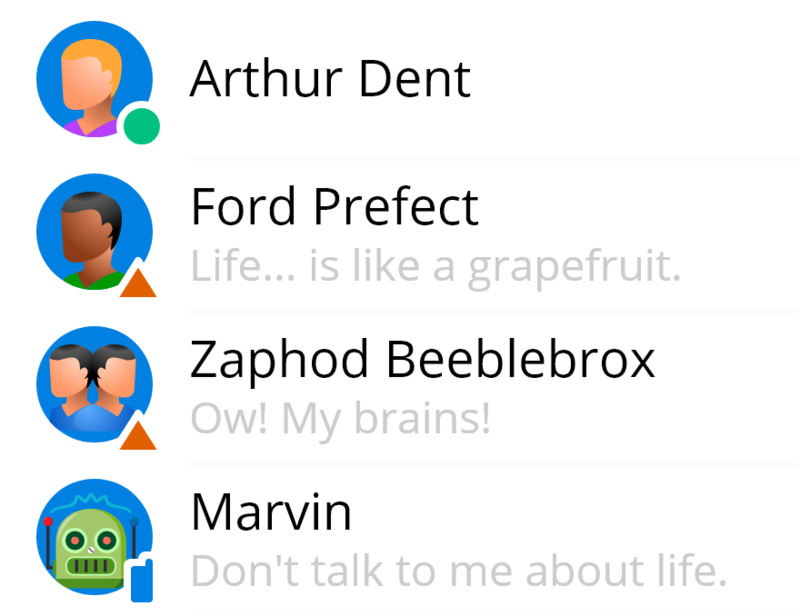 Track multiple conversations with tabbed chatting. Contact status and unread message counts are available at a glance. Insert emoji, images, voice clips, files, and configurable text snippets. Expose topics for group chats to advertise purpose or broadcast important information to users. Get the attention of a particular user by leveraging @mentions, which break through muted windows and surface special alerts to the recipient. Since adopting Trillian, we've been able to eliminate hold times between customer service and technical support, resulting in a tremendous improvement in experience for our customers. from most of today's "team communication" tools which have a reduced focus on this classic instant messaging utility. Set yourself online, away, do not disturb, or even invisible so that your contacts know if you're available for chatting or not. Additionally, customizable status messages are a great way to share your current working status to your entire team without any effort on their part. Meet Tricia McMillan, your company chat bot. Customizable slash commands offer endless possibilities for unique and company-specific integrations. Query company-specific databases, check the company bus schedule, or even program Tricia to send messages to specific group chats as a part of your larger devops practices. The day we made the switch to Trillian, pretty much everyone agreed that it was a huge win for us and amazingly easy to use compared to what we were using before. Trillian "just works" across desktop, mobile, and web-based devices and our team is happily leveraging all three.